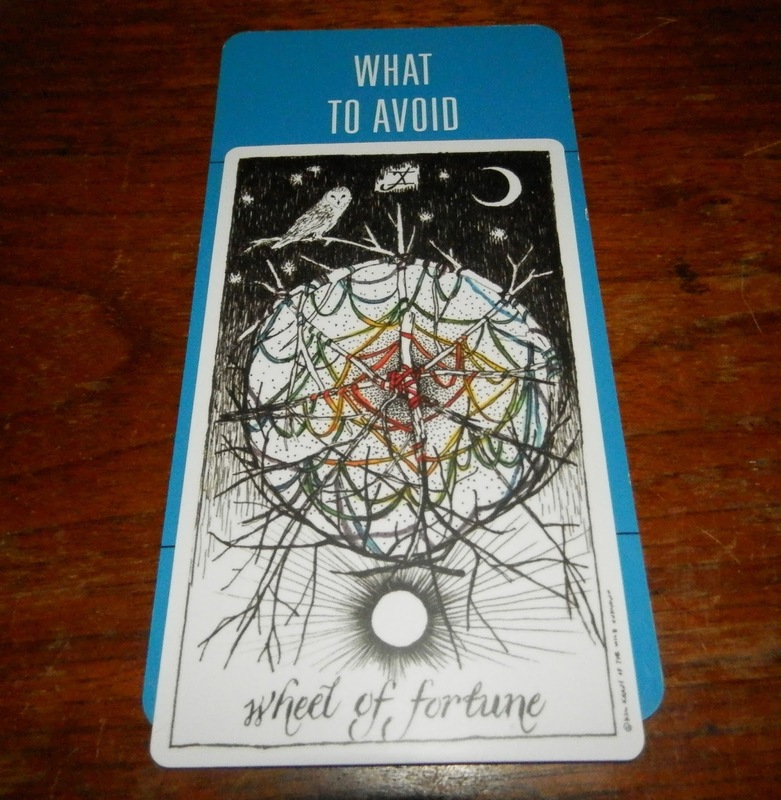 Today's Draw: Wheel of Fortune from the Wild Unknown in the What to Avoid position from the Deck of 1000 Spreads. Did you learn NOTHING from my post day before yesterday? Are you still thinking in dualities? Why do you suppose this message has come to us twice? Today's pair circles right back around to the post from two days ago. So clearly SOME OF YOU need to be told twice. 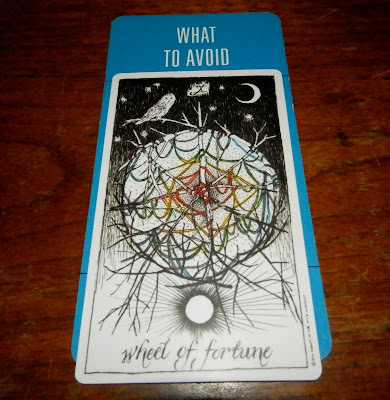 But this combo clearly tells us to avoid Wheel of Fortune thinking, in that sometimes you're in favor at the top of the wheel and sometimes you're out of favor at the bottom. It's time for us to at least consider that everything happens to our benefit. Everything fuels our growth. Nothing ever goes wrong. Therefore there is no "in" or "out" of favor. We just always have favor. See? If you believe everything happens for a reason, and if you trust that God acts in our best interests, then there simply can't be a "bad" or a "wrong". Either that, or you don't really believe that God watches over you and acts in your best interests on good days, bad days and in-between days, too. And if you think he's so moody that he likes you some days and not the next, then you're creating a god in man's image, not one with infinite love and wisdom and foresight and power. When we resort to this dualistic judgment of the things in our life—in/out, good/bad, favorable/unfavorable—we agree to live life on a rollercoaster ride of being up and down, loved and unloved, in favor and out of favor. We agree to be bipolar, in a sense, rather than balanced in the trust that everything is there as a gift or opportunity. So put some more thought into this and see if you can catch your self in the act of thinking this way. Ask yourself how it really serves you to think you're sometimes in favor and sometimes not. And if it doesn't serve, ask yourself why you do it. And what does it say when things are just so-so in your life. Does your God love you then? The more I think of all of this stuff, it just doesn't make sense to continue of in a good/bad mindset. How about you? From a different deck, I pulled the Wheel of Fortune today as a clarifying card. I felt it was telling me there will always be ups and downs in life so learn to deal with both. Sort of the conclusion you came to. Everything happens for a reason and some sort of growth can come from it. Or should.